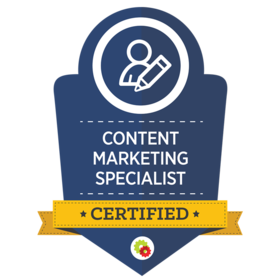 You have successfully completed the Content Marketing Specialist Certification: The Content Marketing Mastery Course 6 Core Modules 40 Video Lessons 6 Handouts (4 worksheets and 2 flowcharts) 6 Quizzes (one for each module). Each "Mastery Class" is between 6 and 12 hours of video training, and contains a number of downloadable handouts and exercises in each lesson. The exams are untimed, and consist of 30-50 multiple-choice and true/false questions. Allow 45 to 60 minutes to complete the exam.